Bujumbura (Agenzia Fides) - "We urge all Burundians to safeguard unity and peace" write the Bishops of Burundi in a statement on the constitutional referendum of 17 May, which concerns the constitutional reform to increase the duration of the presidential term from 5 to 7 years, with no more than two consecutive terms covered by the same person. The reform is provoking strong contrasts, because the opponents consider it an expedient of President Pierre Nkurunziza to remain in power for another 15 years (see Fides 2/3/2018). Recalling the democratic turnaround of the Arusha Peace Accords that put an end to the civil war, the Bishops underline that since 2015, democracy has been in crisis. In that year, in fact, President Nkurunziza presented himself in the elections to obtain a third term in violation of the Constitution and the Arusha Accords themselves, provoking a serious political, institutional, social and economic crisis, which pushed millions of Burundians to take refuge in neighboring countries. The new reform of the Constitution, according to the Bishops, goes against the Constitutional Charter itself. "In fact, it is questionable whether the provisions of Article 299 of the Constitution that currently governs us have been taken into account. 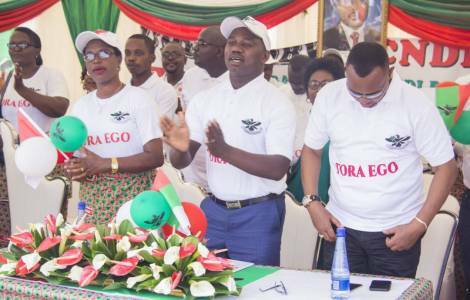 This article states that no revision procedure can be applied if it undermines national unity, the cohesion of the Burundian people or reconciliation. As we can see, instead of uniting the Burundians, the work carried out and the resulting draft constitution seem to have exacerbated the differences. In our opinion, as we have already said, the moment for a profound amendment of the Constitution was not appropriate", affirms the statement sent to Agenzia Fides.